Facebook’s dominance in the social media market may be slowly dwindling as teen users in the US begin to show a distinct preference for the services offered by the likes of YouTube, Snapchat, and Facebook’s own Instagram. This is according to the latest research from the Pew Research Center, published on May 31st, which clearly shows that unlike in recent years, Facebook is no longer the dominant online platform among teens. To put some numbers behind that claim, only 51% of US teens aged 13-17 say they use Facebook; down 20% from 2015. 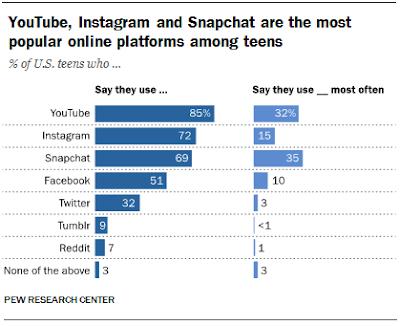 Facebook now holds a lower status among US teens than YouTube, with 85% making use of the platform, as well as Instagram (72%) and Snapchat (69%). 743 teens were interviewed as part of the survey, along with 1,058 parents of children aged 13-17. This apparent mass-departure among teens could potentially be worrying for Facebook, as if this trend continues their eventual loss of market share is surely inevitable; it’s simply a matter of time. Facebook as a larger company are arguably too big to fail at this point, especially when you factor in their ownership of Instagram which continues to gain popularity among this demographic, but Facebook as a platform may struggle if they fail to attract these users back. With the same survey revealing that 95% of teens now own a smartphone, that’s a substantial market to miss out on.